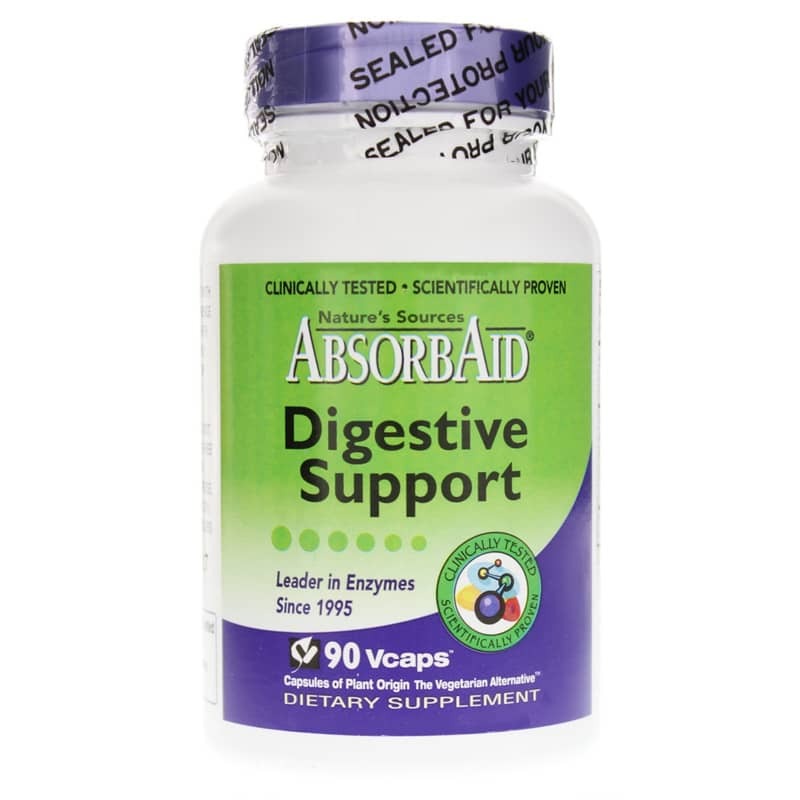 AbsorbAid by Natures Sources is a plant digestive enzymes supplement that provides support for relieving stomach distress, as well as helping the body digest all food groups, including dairy and fats. Enzymes need to survive the stomach in order to get into the small intestine to provide better absorption and AbsorbAid is not destroyed by stomach acid. It's a natural approach to stomach distress unlike antacids and acid blockers. AbsorbAid is the vehicle that delivers nutrients to the blood and is the healthy solution for stomach distress problems. Natures Sources proprietary blend and stabilization process make AbsorbAid useful in a wide pH range so it works well for more individuals. Other Ingredients: vegetarian capsule (hydroxypropylmethylcellulose [HPMC] and water), rice starch, plant cellulose, silicon dioxide and l-leucine. Contains NO: sucrose, wheat, gluten, yeast, dairy, soy, preservatives, artificial colors or flavors. Adults: Take 2 capsules with each meal (more should be used by individuals with compromised digestive systems). If you experience occasional indigestion or nighttime discomfort, open 2 capsules and mix in 2 to 4 ounces of room temperature water. If you are pregnant or nursing, please consult your healthcare professional before using this product. Keep out of the reach of children. If symptoms persist, see your physician.